a. 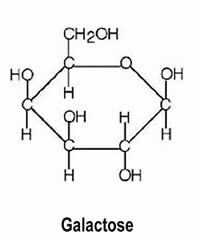 The simplest monosaccharides have the formula (CH2O)n. Those with three carbons are called trioses; four, tetroses; five, pentoses; and six, hexoses. b. They are called aldoses or ketoses, depending on whether their most oxidized functional group is an aldehyde or a ketone. a. The configuration of the asymmetric carbon atom farthest from the aldehyde or ketone group determines whether a monosaccharide belongs to the D or L series. In the D form, the hydroxyl group is on the right; in the L form, it is on the left. b. An asymmetric carbon atom has four different chemical groups attached to it. c. Sugars of the D series, which are related to D-glyceraldehyde, are the most common in nature. a. Stereoisomers have the same chemical formula but differ in the position of the hydroxyl groups on one or more of their asymmetric carbons. b. Enantiomers are stereoisomers that are mirror images of each other. c. Epimers are stereoisomers that differ in the position of the hydroxyl group at only one asymmetric carbon. For example, D-glucose and D galactose are epimers that differ at carbon 4.
a. 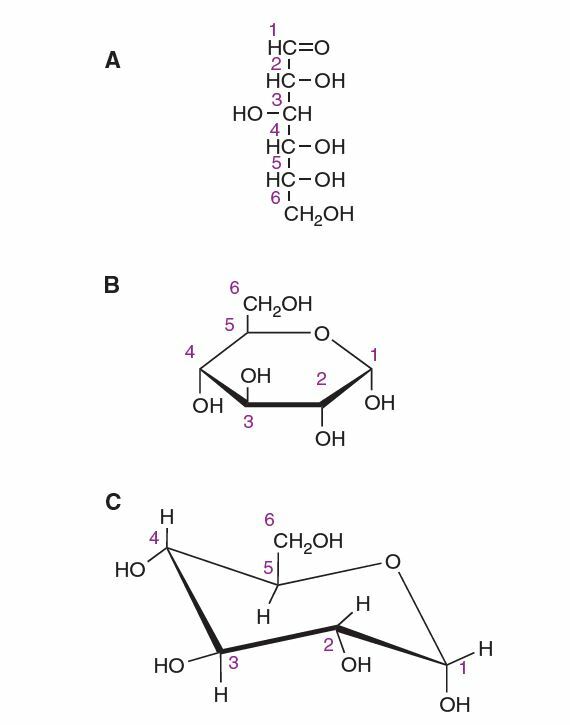 Although monosaccharides are often drawn as straight chains (Fischer projections), they exist mainly as ring structures in which the aldehyde or ketone group has reacted with a hydroxyl group in the same molecule. b. Furanose and pyranose rings contain five and six members, respectively, and are usually drawn as Haworth projections. c. The hydroxyl group on the anomeric carbon may be in the α or β configuration. In the α configuration, the hydroxyl group on the anomeric carbon is on the right in the Fischer projection and below the plane of the ring in the Haworth projection. In the a configuration, it is on the left in the Fischer projection and above the plane in the Haworth projection. d. In solution, mutarotation occurs. The α and β forms equilibrate via the straight-chain aldehyde form. Glucose is the most important carbohydrate; most dietary carbohydrate is absorbed into the bloodstream as glucose formed by hydrolysis of dietary starch and disaccharides, and other sugars are converted to glucose in the liver. The straight-chain structural formula (aldohexose) can account for some of the properties of glucose, but a cyclic structure (a hemiacetal formed by reaction between the aldehyde group and a hydroxyl group) is thermodynamically favored and accounts for other properties. The cyclic structure is normally drawn, the Haworth projection, in which the molecule is viewed from the side and above the plane of the ring; the bonds nearest to the viewer are bold and thickened, and the hydroxyl groups are above or below the plane of the ring. The hydrogen atoms attached to each carbon are not shown in this figure. The ring is actually in the form of a chair. d-Glucose. (A) Straight-chain form. (B) α-d-glucose; Haworth projection. (C) α-d-glucose; chair form. 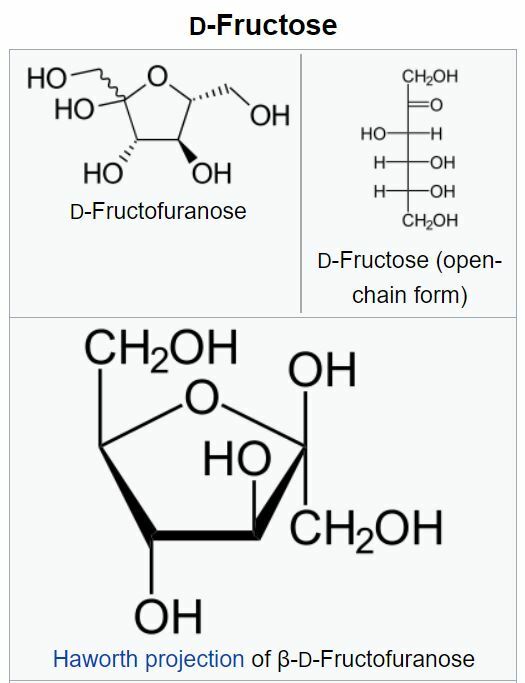 Fructose has a cyclic structure. Fructose is a simple ketonic monosaccharide. Due to the presence of the keto group, it results in the formation of intramolecular hemiacetal. In this arrangement, C5-OH combines with the ketonic group present in the second position. This results in the formation of chiral carbon and two arrangements of CH2OH and OH group. Hence D-fructose exhibits stereoisomerism in which α-D-fructopyranose and β-D-fructopyranose are the isomers. Galactose exists in both open-chain and cyclic form. The open-chain form has a carbonyl at the end of the chain. It is a monosaccharide sugar that is less sweet than glucose and fructose.